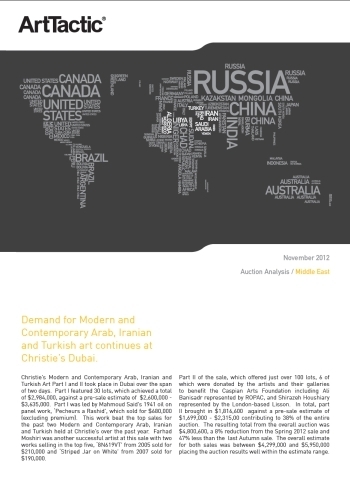 Solid demand at Christie’s Dubai, as Modern and Contemporary Middle-East sales comes well within the estimate. Christie’s Modern and Contemporary Arab, Iranian and Turkish Art Part I and II took place in Dubai over the span of two days (23/24.October). Part I featured 30 lots, which achieved a total of $2,984,000, against a pre-sale estimate of $2,600,000 – $3,635,000. Part I was led by Mahmoud Said’s 1941 oil on panel work, ‘Pecheurs a Rashid’, which sold for $680,000 (excluding premium). Part II of the sale, which offered just over 100 lots, 6 of which were donated by the artists and their galleries to benefit the Caspian Arts Foundation including Ali Banisadr represented by ROPAC, and Shirazeh Houshiary represented by the London-based Lisson. In total, part II brought in $1,816,600 against a pre-sale estimate of $1,699,000 – $2,315,00 contributing to 38% of the entire auction.